I’ve been thinking about the potential of a three speed internal hub gear that I could use on my mountain bike for some time. Something that retained most of the elegance and reliability of a single speed, but with a bit more range. And minus quite a bit of weight when compared with hub gears with more ratios. I live a little way from the trails which requires some road sections to access. A single speed would be pretty slow so a higher gear is nice to have. Plus I’m weird enough to quite like a good, steep, technical climb where a lower gear also comes in handy as well as making longer rides more manageable. 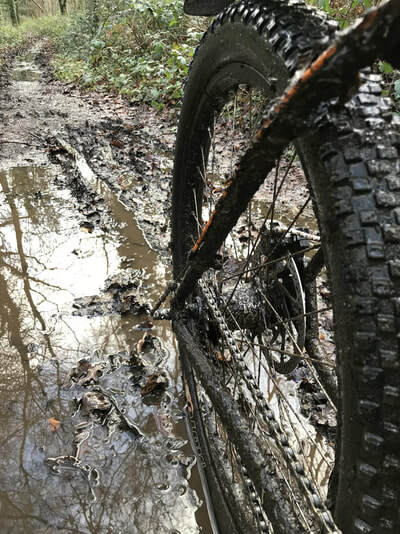 However, the three speed hubs that are currently available tend not to be particularly well sealed from the elements or up to the loadings of off-road use. One option I considered was to design a new hub from scratch, but I currently lack the time and resources to do this. 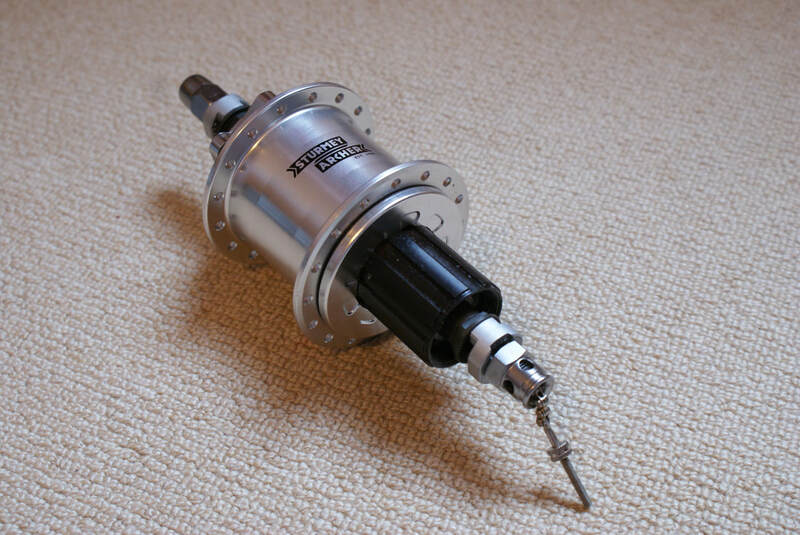 Given that the general mechanics of a three speed hub are well proven and that the same general design is used by all the main manufacturers, I decided instead to use a number of the key components from an existing hub while replacing or modifying those parts that are not up to the specific job that I want to use it for. Shimano, Sram and Sturmey Archer all make 3-speed hubs to fit a frame with 135mm dropout spacing and a disc rotor mount. Of these three, Sturmey Archer have the best spare parts support and the most shifter options as well as a strong heritage when it comes to making hub gears. 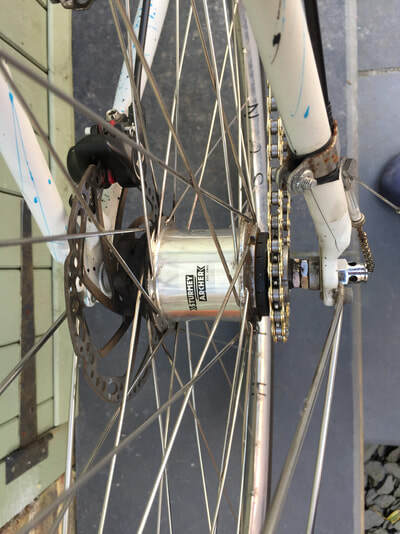 I have therefore modified a number of hubs by Sturmey Archer that include a couple of S-RK3 (toggle chain shifter hub), a RS-RK3 (a rotary shifter hub) and a CS-RK3 (toggle chain shifter with a cassette body). 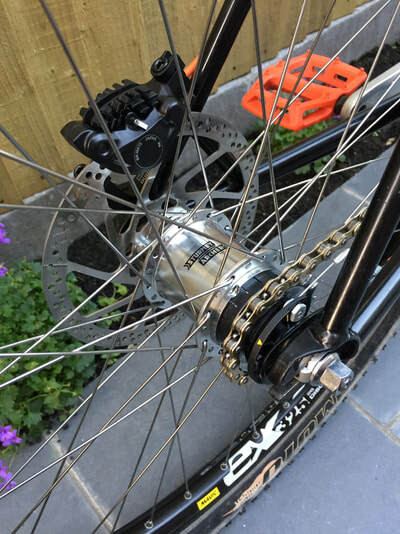 Sturmey Archer list all of their three speed hubs as having an overall gear range of 177%, with two gear steps of 33%. I just like to think of the hubs as having a direct drive (1:1) along with an overdrive at 3:4 and an underdrive at 4:3. 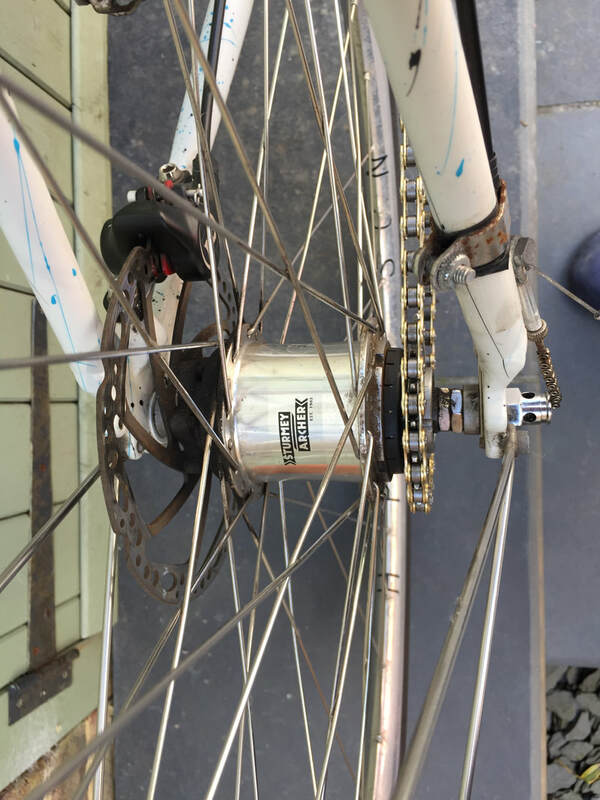 In my experience this range has been enough to get me everywhere that I need and although the jumps between gears are big compared with a derailleur set-up (approximately the same as shifting between 14, 18 and 24 tooth sprockets on a cassette), I don’t find them so big as to be awkward to change between. I’m still not sure whether I will be selling the hubs, but if I do then it will only be once I’ve proved to myself that they are reliable for general off-road use. Even then I will most likely only sell a relatively limited number to begin with to see how they hold up under different riders and in different conditions. As for pricing, this is something that I’ll look into only once I’ve decided whether I’m going to sell the hubs. ​I've had a go at answering some of the questions that I get asked most often about the hub here.